On 22 August 22nd, 1958, while bar hopping in lower Manhattan with a friend from college, I stopped in at the Five Spot Café on Cooper Square to hear Thelonious Monk. 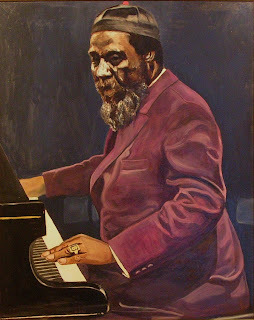 I was already a jazz enthusiast but I’d never seen nor heard anything like Monk. He played his own compositions featuring strange chords and infectious rhythms. 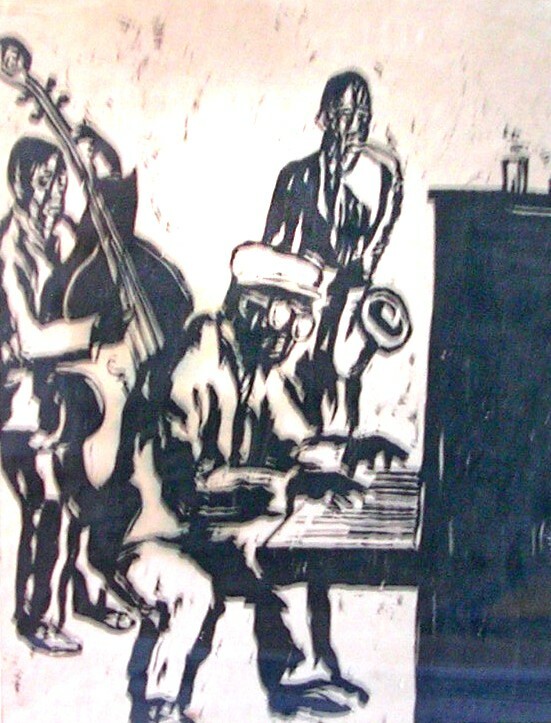 While the other members of his quartet played their solos, he’d get up and shuffle around in a little dance, seemingly oblivious to everything but the music. I subsequently went to hear Monk in many other places such as The Jazz Gallery, Town Hall, Randall’s Island and even Central Park. His records began to dominate my record collection. When I was introduced to printmaking, my first woodcut was of Monk. 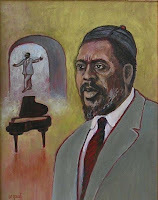 I've drawn and painted musicians for years but the most compelling image for me was always Monk. When Michelangelo painted The Creation of Adam, he depicted God as a muscular man with a long gray beard. Were I to undertake such a project, I could just as easily imagine God as a well-dressed, stocky black man in a strange hat dancing around a piano where he has just established the rhythm. On a recent trip to England I was able to pick up a copy of a new biography, Thelonious Monk, The Life and Times of an American Original by Robin D. G. Kelley. It’s a massive, scholarly dissertation, which took Mr. Kelley fourteen years to research and write. Monk’s life is documented from his family origins in North Carolina through his death in 1982 in twenty-nine heavily footnoted chapters. Just the acknowledgements of assistance in the book’s preparation take seven pages. What emerges is a story of total dedication to music, with more than its share of tragedy, yet laced with humor. Monk was a funny man and humor is there in much of his playing and comments. He suffered from what has come to be known as bi-polar disorder, yet his playing was prolific, even if his recording was not. Monk left school at sixteen to play in local clubs in his San Juan Hill neighborhood on Manhattan’s West Side. Apart from touring the country for two years as pianist for a woman evangelist, he continued that pattern until he was hired as the house pianist at Minton’s Playhouse in Harlem at the start of 1941. It was his first regular job and he was twenty-three. There he learned from older musicians and taught the younger ones. 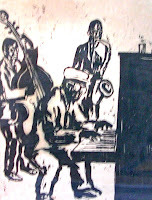 When bebop took off after the war, musicians he had played with, such as Dizzy Gillespie, Charlie Parker and Bud Powell, started becoming famous and had steady work, both at clubs and in recording studios. That eluded Monk until the fifties. Known and revered by the jazz community, Monk really only came to the wider public after getting a long engagement at the Five Spot in 1957. Several themes permeate the book, beyond or behind the music: the women in his life; the effects of drugs and racism in the environment, and the irony that his long delayed success and critical acclaim never brought him the financial rewards that would have been expected. Thelonious, who was named after his father, was supported, physically, morally and financially by three women in his life. His mother Barbara took her three children to New York when Thelonious was four years old to get them out of the poisonous, racist atmosphere of North Carolina. She raised him amidst considerable adversity and helped support him through many lean years. He married Nellie Smith, the sister of his best friend, in 1948. Nellie was his wife, closest companion and mother of his two children, personal manager and chief caregiver until his death in 1982. However, through most of his career he had a patron and friend in Baroness Pannonica de Koenigswarter, a Rothschild heiress. Monk met her in Paris on his first European tour in 1954. She had married Baron Jules de Koenigswarter in 1935 and had two children before the war and three more after it. Both Nica and her husband were decorated war heroes but following the war, the Baron became a career diplomat. She grew bored with the diplomatic routine and they separated. Her love of jazz took her to New York City where, to the chagrin of the management, her suite at the Stanhope Hotel became a second home to jazz musicians. Charlie Parker died there, and two decades later, her house on the Palisades, overlooking mid-town Manhattan, became Monk’s home for the last nine years of his life. Monk’s life and career spanned a period of extreme racial turmoil. His mother took him out of the south, but San Juan Hill was not without its own racial tensions, and the young Thelonious had to fight his way to and from school. His oft-cited moodiness may have been a symptom of his manic-depressive imbalance but the frequent reports of racially motivated killings contributed to it. Monk played many benefit concerts for civil rights groups but he didn’t talk about it much. He was scheduled for a Time Magazine cover story on Nov.28th, 1963. His image was replaced by that of President Johnson, following the November 22nd assassination of JFK. The Time cover story would eventually appear three months later. Drugs surrounded him. He lost a nephew and countless friends and colleagues to drug overdoses. At times, Monk was the only member of his quartet not addicted to heroin. While he escaped addiction, his career was hindered by his arrest and thirty days of jail time in 1948 for possession of marijuana. That cost him his cabaret card and the ability to play in NYC jazz clubs for a decade. Time had written its cover story and Monk had a successful 12 city tour of Europe to introduce his first record for Columbia, Monk’s gross income reached $78,680. However, after deducting travel and recording expenses, salaries, commissions and taxes, he was left with a net of $33,055. Despite continuing to tour and play fairly regularly, that net had declined to $17,735 in 1966, not really a princely sum for a musician acclaimed around the world. It got worse from there on. His last recording date was in 1972. In 1973 he withdrew to Nica’s house and only rarely played in public after that. Two concerts at Carnegie Hall in 1976 were his last public performances. Reading through the stories of a vast number of musicians whose lives were cut short by drugs brought up some personal thoughts. In Gay Talese’s book on his Sicilian roots, Unto The Sons, the story of how the Sicilian Mafia facilitated the way for American troops to move through Sicily and up the Italian peninsula is illuminated. It’s well known that the Mafia collaborated with the US Government to keep the Communist Party out of power in post-war Italy. What is less well documented is the theory that some part of the government conspired with the Mafia to sedate the frustrated black masses in American cities through the supply of massive amounts of heroin. People, and young people in particular, are incredibly influenced by peer pressure and by what’s going on around them. When Monk’s peers in New York City were dying like flies from heroin, I was growing up in the nearby white suburbs. The main commercial and peer pressures that we faced were to wear dirty white buck shoes, to smoke cigarettes, and to dance the Twist to the music of Chubby Checker. I gave in to the first, but I found cigarette smoke so repulsive, and most pop music so irritating, that I never really succumbed to the others. However, I was influenced by other people around me. The father of my neighborhood friend smoked wonderfully aromatic cigars and my proximity to them started a lifelong habit. Later a college friend took me by the Jack Daniel’s distillery in Lynchburg, Tennessee, introducing me to another substance I’ve used and abused ever since. Indeed, at this time every year, I look forward to a pumpkin pie laced with Jack Daniel’s Old No.7. The influences we’re subjected to in our youth cast a lasting shadow on our lives. Some are more fortunate than others. This week many of us are following the pilgrims’ tradition of giving thanks to God for our survival, our food and shelter, and our family and friends. In doing so, I am adding another personal thanks for being born in the right time and place to be exposed to one of the greatest artists of the twentieth century. 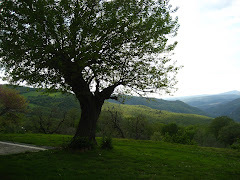 Last spring, following a joyful visit to the UK, I commented with uncharacteristic enthusiasm. The country had changed dramatically since my three-month sojourn in London at the peak of the punk period in the late 70’s. I was favorably impressed with the gentlemanly demeanor of the three candidates for Prime Minister and the brevity of the electoral campaign. Nick Clegg was quoted as saying: ”This almost unseemly knee-bending allegiance to the White House: I don’t think it’s good for Britain…for our self-respect”, prompting optimism for a more rational and independent UK leadership. Up until the election, the Lib/Dem leader Clegg was regarded as the rising star of British politics, but when the results were in, he was among the losers. With the Liberal/democrats suffering an unexpected net loss of votes and seats, Clegg had little choice but to join in a coalition government with the ascendant Tories. Last week I returned from another visit to the UK, during which the first major initiative of the new government was announced. While this government shows no tendency to do the bidding of the White House, the drastic new budget cuts smell of the same Neo-con ideology that guided the Bush Administration to precipitous decline. George Bernard Shaw said that “Britain and America are two countries divided by a common language”. They are different though, in more ways than just linguistic nuance. The UK has an extensive network of social services while the US government probably provides less services to its people than any other industrialized country in the world. Given the dimensions of the welfare state in the UK and the magnitude of its public debt, perhaps some reform of the welfare system is necessary, desirable, or even inevitable. “Everyone” seems to think the cuts were needed. Being an expert in neither economic theory nor in the economy of the UK, I tend to put my trust in the analyses of Paul Krugman and George Monbiot rather than “everyone”. The former insists that a major recession is not the time to cut public spending, while Monbiot cites the current measures as another example of what Naomi Klein calls “disaster capitalism”, i.e. the use of economic crises to initiate policies designed to redistribute wealth upward. The effectiveness and fairness of welfare reform are subject to reasonable differences of opinion, but cuts to public transportation and education hardly seem rational at a time when the economy is in recession and there is a widely held desire to see more people move from welfare to the workforce. The US and the UK may be divided by language but on this trip I was reminded of their shared taste for irrationality. One of the few bright spots of my stay in the England during the 70’s was an appreciation of its adoption of the metric system. British irrationality tends to run to the quirky and idiosyncratic. I suppose I would be asking too much of a country that lived for centuries with a monetary system featuring (if I remember it correctly) twelve pence to a shilling and twenty shillings to a pound, or twenty-one to a guinea, to fully accept a systematic decimal system. Still, when one reads the opt-repeated stories of fish mongers being fined in the market for selling fish by the pound, one can only wonder why local districts aren’t fined for posting road indications in miles, or why nurses are not arrested for recording patients’ weight in stone. Our American irrationality appears to be grounded less in nostalgia than in laziness and disease. I remain convinced that President Reagan’s mid-stream cancellation of metrification in 1982 was the first sign of the tragic onset of Alzheimer’s disease. Before we left London, I saw a newspaper article relating that sales of bidets in England were way down from a few years ago when people had the money to travel more, and it was thought “smart” to have a bidet in your bathroom, but recently the mode had changed. Here I’d thought that British hygiene had finally taken a great leap forward but no, it was just a matter of trendiness. Bathtubs are also being phased out. Who knows when and if flush toilets will be deemed no longer modish? The curiously incongruous aspects of British life may be amusing but in the US our abrupt swings between black and white absolutes seem more schizophrenic than quaint. Not so long ago, smoking and drinking were promoted by the government and various other American institutions, while gambling and many forms of sexual activity were illegal and suppressed. That’s all been reversed, which may be a good thing, or not, but the vehemence and speed of the turn-about have been radical. This week’s mid-term elections have followed a similar pattern. Only two years after voting for change, the electorate has returned to its embrace of oligarchy. While our language may divide the two countries, we are united in our belief that English is the only language of any importance. On this trip we spent some time in the company of an English high school student, i.e. one who’s doing her A levels, in British parlance. I was amazed that among the four subjects she was studying, none was a foreign language. For years I’ve suspected that pre-collegiate education in the US isn’t very good but I’ve never been aware of any American high school that doesn’t require the study of a language. Perhaps it’s worse than I thought, or maybe by now the Texas Department of Education has decided that foreign languages are as un-American as the Constitution. It’s true that one can manage in much of the world speaking only English, but it’s also true that people from countries where it’s the only language tend to be the hardest for other people to understand. Our hubris extends to believing that our colloquialisms and regional accents are universal. Despite the misgivings, it was a good trip. Ryan Air has smoothed out its loading procedures at Stansted. We got to see the beautiful Dyffryn Gardens near Barry and we spent a lot of time with our delightful ten-month-old grandson. While in London, I was able to replenish my supply of Mr. Taylor’s Moustache Wax at Taylor of Old Bond Street, located naturally enough by British logic, in Jermyn Street.